Looking for a local, true farmer's market in New Zealand? Scroll down this page and you will see the farm markets, farm stands, roadside stands, produce markets, even garden fruit and vegetable stands and seasonal community farmer's markets in New Zealand, sorted by county. Markets offering organic or sustainably grown produce are identified by the words "organic" and/or "sustainable" in Green, next to their name. If they have a website, the name will be in blue and underlined; click on it and it will open their website. Otago Farmers Market - Fresh fruit from Central Otago, vegetables and berries from the Taieri plains; every week over 65 different vendors come together from all over the province to create one of the busiest Farmers Markets in Australasia. Moray Place, Dunedin 9058, New Zealand. Phone: 0274-636-275. Email: mm@otagofarmersmarket.org.nz. Each Saturday morning thousands of people flock to the Dunedin Railway Station north car park to purchase local food directly from the people who made it. Our customers love the friendly atmosphere, the fresh produce and the bargains that can always be found. With vendors all selling different products it is easy to see why so many local people choose to shop here. There is food to eat on site, buskers and weekly cooking demonstrations. 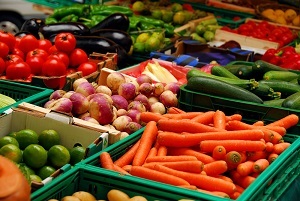 Find out more about the Otago Farmers Saturday Market click here.